Real life volcanoes are very interesting structures. The thought of them lying dormant waiting to erupt is a thought that people who live in areas with volcanoes have often. If your child is interested in volcanoes and how they work, building a volcano is a great activity for them. Building a volcano is a popular science project as well. It is easily constructed, is cost efficient and can be done with minimal time invested. It is an easy and fun project for children of all ages. It can even be used as a teaching instrument. Here is how you can build a volcano all on your own. Continue reading to find out how. Use a piece of plywood to build your volcano on. It needs to be 8 inches wider than the base of the volcano. 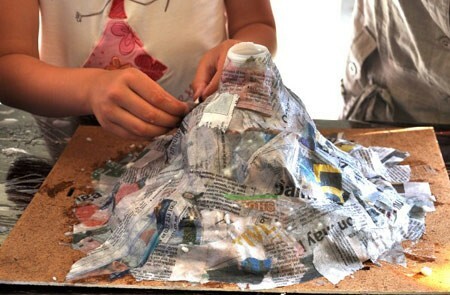 Use paper mache plaster or salt water dough to shape into the form of a volcano. Use the 2 liter bottle at the center. Do not cap the bottle. Shape the model volcano material very close to the opening of the 2 liter bottle. Make channels and pathways for the lava to run in along the side of the volcano. Start at the top and end at the base. Allow the model to dry. You can paint it with spray paint or acrylic paint and add plastic trees to the plywood base. You can use green aquarium trees and trim them to the right size. When the paint job has dried, spray the model volcano and plywood with a clear sealant for protection. Combine a tablespoon of liquid dish detergent and I tablespoon baking soda with a few drops of red food coloring in a container. This is what your lava will be and look like. Pour the lava mix into the opening carefully at the top of your model volcano. Place the volcano is a safe area so that when it erupts with lava it doesn’t get on anything it can damage or stain with the red food coloring. You can set it up outside for a good display. Pour a ¼ cup of white vinegar into the bottle. The vinegar will react with the baking soda and start to foam. Soon, your volcano will fill and begin to erupt. Watch the lava run through the channels on the side of your model volcano.